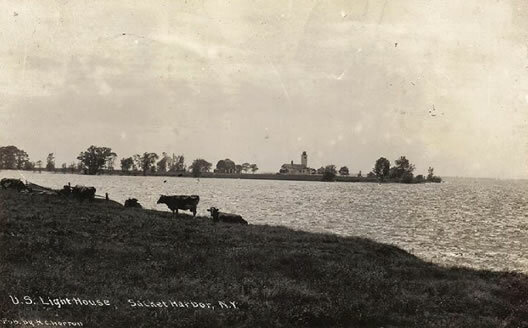 Horse Island and lighthouse, viewed from War of 1812 battlefield at Sackets Harbor, circa 1909. Galloo Island Lighthouse: erected in 1820 and rebuilt in 1867, recently sold at auction as surplus federal property, contributed by Mark A. Wentling. Includes a complete list of former keepers. Horse Island Lighthouse: a.k.a. "Norn Island Light" or "Sackets Harbor Light," erected in 1831, and rebuilt in 1870; includes, list of former keepers, courtesy of Great Lakes Lighthouse Research, and historic images and location map.